It was May 2006 and I was getting brave. I’d had two trips to Northern Ireland in the previous twelve months, but now it was time to go properly foreign, where the currency is different, to the Republic Of Ireland. 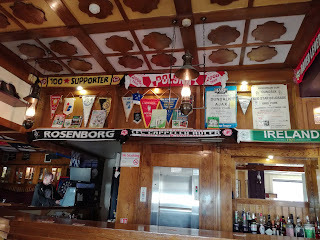 My passion for Irish football was growing rapidly, ever since the day I set foot in Derry City’s Brandywell, I started to soak it all in, to research it, to read about the history, to plan some trips…. 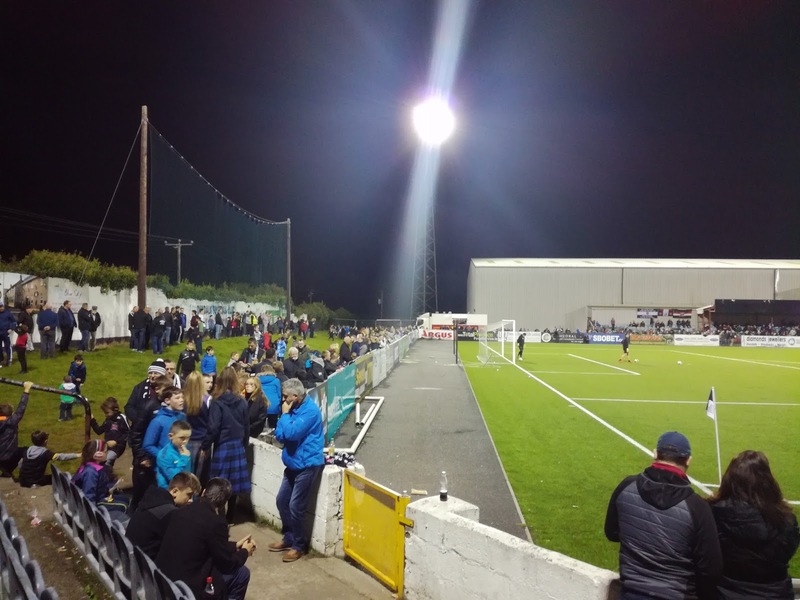 It was to be a relatively simple trip, Derry were playing at St Patrick’s Athletic on the Friday night, so Dublin was to be the destination, but I couldn’t find a game on the Saturday to combine with it. 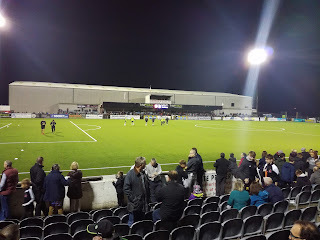 But, I did find a game on the Thursday night, Dundalk at home to Shamrock Rovers. So that was the plan, a flight over on Thursday morning, and then a train up the East coast through Drogheda and into the town nicknamed El Paso. Dundalk were a big club who had fallen upon hard times, and bizarrely we had a game between two of the biggest names in Irish football, playing in the second tier. I’d read about Dundalk, the great sides of Jim McLaughlin, European games against the likes of Liverpool, Celtic and Spurs. I’d also read about the infamous European Cup tie against Linfield which from a timing perspective in terms of The Troubles couldn’t have been worse. That Thursday night saw a confident Rovers side arrive in Dundalk, and eventually they left with a 2-0 victory. Rovers bought a large support with them and I can remember the aftermath of the game as trouble broke out in the road, leading to Gardai wading in with batons. That season ended controversially as well. Dundalk won a two legged promotion play off game with Waterford United, only to not be admitted to the Premier Division. Galway United who finished below them, and didn’t compete in the play off got the nod instead. It kicked off, it all came down to the interpretation of what the play off was designed to achieve (long story – won’t dwell on it right now). However, the whole event will be remembered for Dundalk fan Mark ‘Maxi’ Kavanagh turning up at FAI headquarters, dousing the reception with petrol and threatening to set it alight as a protest. Dundalk did eventually get promoted in 2008, but it all started to change in 2012 when Stephen Kenny was appointed Manager. I watched Kenny’s Derry sides over two spells, whereas he’d also had spells at Dunfermline Athletic and Shamrock Rovers. Dundalk and Kenny ended up being a match made in heaven. Three League of Ireland titles in a row, an FAI Cup, two League Cup’s, the groups stages of the Europa League, financial security, and a surge in attendances. They won’t win the league this year, that’s Cork’s to lose, but they do have a chance of winning another FAI Cup. Some would argue that the side that won the league in 2016 was the greatest club side Ireland had ever produced, Rovers might dispute that though. 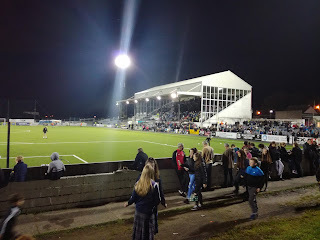 With a weekend in Ireland planned for some time, the fixture between Dundalk and County Louth rivals Drogheda United was too good an occasion to miss as far as I was concerned. Logistically it was easy enough to get to being based in Belfast, the last train being almost perfectly timed for after the game. I arrived in Dundalk mid afternoon, collected a match ticket that had very kindly been reserved for me and then had a wander into town, retracing my steps of eleven years ago by calling for sustenance at the Jockeys pub. 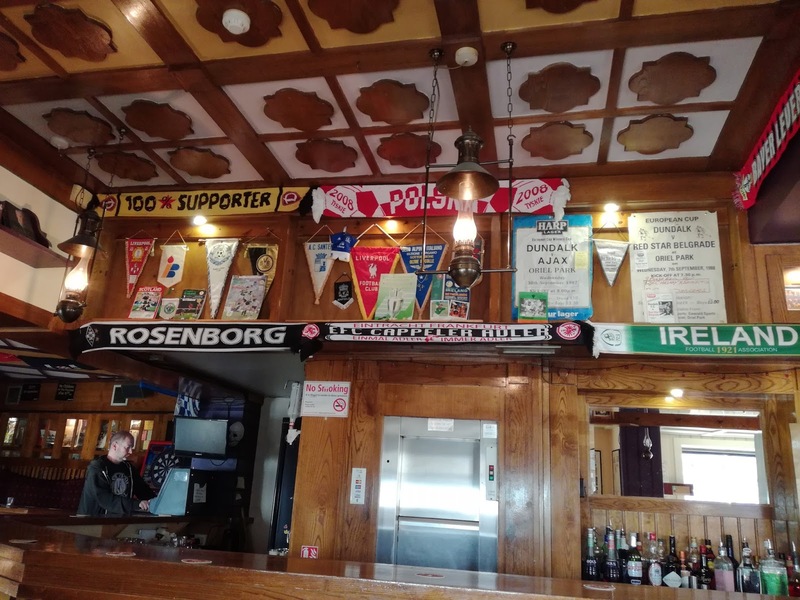 It was Jimmy’s Bar that impressed me the most though, the walls were plastered with Dundalk FC memorabilia, with posters, match reports and programmes from some of the great games and occasions. European nights in Dundalk were clearly special events and Jimmy’s quite rightly celebrated the fact, as they did the three in a row achievement. Pre-match their was time for a quick one in the clubhouse, which was exactly as I remembered it, before taking a seat in the impressive main stand at Oriel Park. Drogheda, despite the fact they are odds on to be relegated, started brightly and could have taken an early lead had it not been for some quick thinking by Brian Gartland to clear the ball off of the goal line. The hosts gradually started to get a grip on the game and took the lead almost on the stroke of half time when Steven Kinsella smashed the ball home after good work by Gartland and Stephen McGuinness. The game was effectively over just after the break when David McMillan floated a header back across goal and into the Drogs net. By this stage I had opted to stand behind the goal and take in the game from a different viewpoint. It also gave me the opportunity to observe the size of the crowd, around 2300, which was three times as many as that day in 2006. What was also surprising was the lack of travelling support, less than a hundred I would suggest, when historically Drogs would pack the away end out. The third and final goal came in injury time when Michael Duffy skipped into the penalty area and curled a low shot into the bottom of the net. 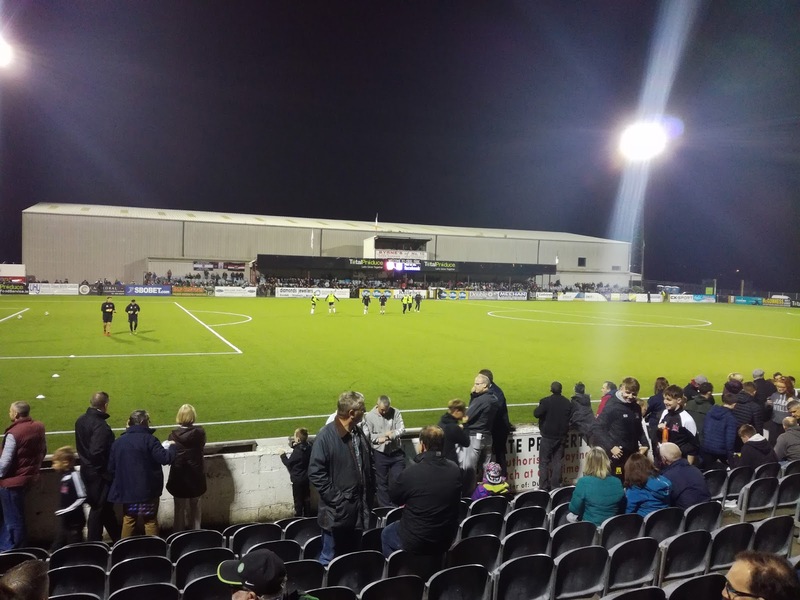 It was a comfortable victory in the end for Dundalk and not unexpected either. They will finish runners up, but given Cork’s end of season form, I would make the men from Oriel Park favourites to regain the crown in 2018. Grass Banking - But Not In Europe! 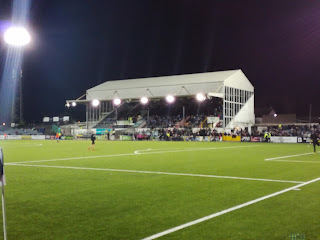 Oriel Park hasn’t changed an awful lot over the years, other than some extra seating has been installed on the terracing to comply with UEFA regulations. The more vociferous followers stand under the cover opposite the main stand (getting them to sit would be like herding cats!). All was going swimmingly well on the train back until we got to Newry and were told an earlier train had hit some cattle. That meant a long delay while buses were organised, and we finally arrived back in Belfast well over an hour after the scheduled time. A minor setback on what was otherwise a fantastic day out at a fantastic football club.